Hello. I'm ui/ux designer currently based in Istanbul. You're thinking - just another designer, but please, take 5 minute and found out why I'm not just another one. My idea of great product design combines a user centered approach with a strong and appealing visual language. I'm currently freelancing and always up for new challenges, where I can collaborate with people and companies to get their product ideas rolling. 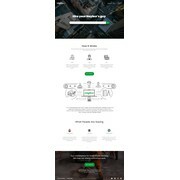 "Great job, Thank you for the desing"
"Wonderful designer, who has provided us with a vivid, eye-catching homepage and custom illustrations. Hope to work with this designer again." "I hired 99designs to create a landing page for a new company. I was pleasantly surprised at the quality of submissions. Levgeniia provided the best designs and couldn't have been more responsive and efficient. 5 stars!" "Great work again! Thank you very much"
"Working with Ievgeniia has been a pleasure. Great designer, very creative and professional!"